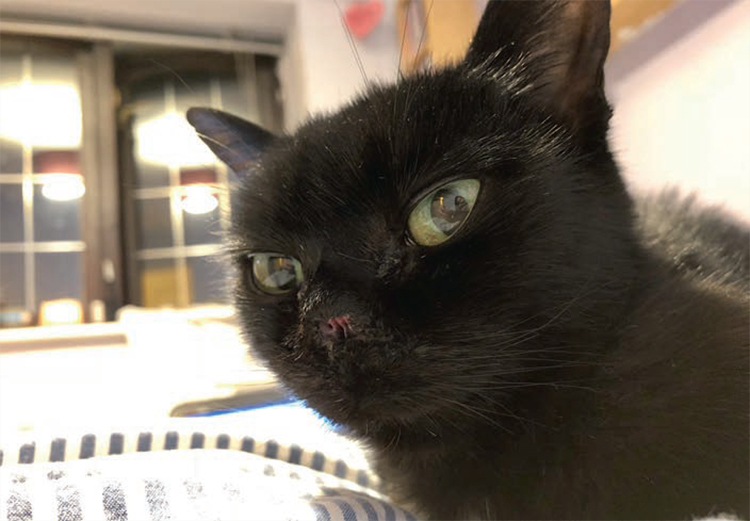 When Lottie Pogson noticed her cat had a lumpy nose, she had no idea that such an innocuous symptom could be life-threatening. Black moggy Tilly came to live with Lottie at her home in Burton-on-Trent, Staffordshire, when she was just a kitten, in May 2009, along with her sister, Trouble. Apart from being on the small side, Lottie says that Tilly had always been a normal cat, with no apparent health issues. Lottie’s best friend, a very experienced vet nurse, had a look at Tilly, and said that her nose needed looking at right away, as she suspected cancer. The first vet who saw her the same day didn’t have the same concerns, so Lottie sought a second opinion. A week later, Tilly had a fine needle aspirate (a sample of skin taken from the lump on her nose), and the results of that test showed she had melanoma — a malignant tumour associated with skin cancer. As Lottie’s vet didn’t offer the treatment that Tilly would require, she was referred to the Willows Veterinary Centre and Referral Service in Shirley, Solihull, under the care of specialist vet James Elliott. Tilly was booked in for surgery to remove the tumour and her lymph nodes to make sure that all of the cancerous cells were gone from her body. This would involve most, if not all, of her nose and part of her lip being removed. The majority of Tilly’s nose, as well as the lymph nodes, were removed. The lymph nodes showed signs that the tumour had spread, which made Lottie even more relieved that they had gone ahead with the surgery. Tilly also received a course of ONCEPT vaccinations, a pioneering treatment which stimulates the immune system to target just the melanoma cells in the body. It has no side effects, so is kinder to the body than chemotherapy. 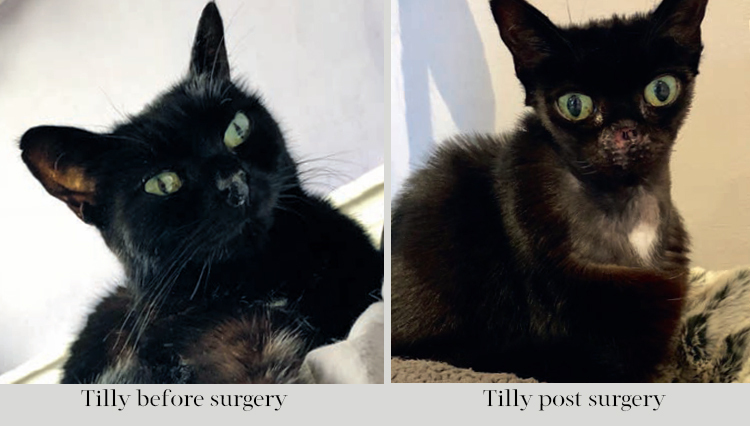 Tilly recovered quickly, and, after spending three days in the vet’s surgery, she was able to go home, wearing a surgical collar — much to her annoyance! So far, Tilly seems to be coping really well with her different facial features, and the only apparent sign that something is different is that she sneezes when she has a drink, possibly due to water getting into her shortened nasal cavities, but this doesn’t seem to bother her at all. Melanoma in cats is quite rare, and white or pale-coloured cats are most at risk. However, it’s important for owners to look out for any black lumps on their cats’ bodies, especially on the head and face. Signs of melanoma include patches of damaged skin that can look like sunburn, which may then turn into a scab, and the tissue may then manifest into a lump on the skin. Consider protecting your cat from the sun’s harmful rays by applying suncream to his ears and nose before he heads outside, and also keep white cats indoors on very hot and sunny days to be on the safe side.